Preset Layouts - Where you use one of the Preset Layouts like "Left to Right", "Top to Bottom", "Box", "Spiral", "Album"
KinoCards is a QR Code Business Card Creator. As an Minimal Viable Product, it only supports Synerzip Business Card. Also it does not supports any storage or login functionality in its version 1. QR Codes on Business Card are really helpful. If you ever get a Business Card with a QR Code, take your Smart Phone, start any popular QRCode Scanner App (e.g QR Droid for Android, QR Reader for iPhone, QR Code Reader for Windows Phone). Scan the Business Card (as shown below) and it will import the contact details as a VCard. On the back side of the Business Card is another QR Code, which takes you to a page with entire Social Profile. Fill in your details and see the Business cards being created. Download the images for printing. The UI is not yet polished, it will be made polished in next couple of days using Twitter BootStrap. Also we will add the functionality to Login with Synerzip Google Apps, where you can store your profile and browse other people's profile (and scan their business card to import contact directly to your address book). This MVP (Minimal Viable Product) was done in 6 hours using NodeJs and KnockoutJS and QR Code and HTML5 Canvas APIs. This session will talk about All Browser based technologies, old, proven, emerging and exciting. Ajax came in picture around 2005ish and since then became defacto. 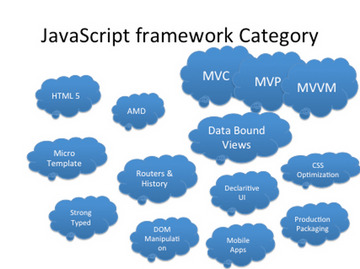 Then Technologies like Dojo, jQuery, GWT emerged changing how Web Applications where built. Emerging services like Twitter, Facebook defined a new way of writing Web Application called "Single Page Application". And recently we are seeing a surge of frameworks like Sencha Touch 2, ExtJs, Backbone, Spline, Knockout, AngularJs, KindoUI, RequireJs, HandlerBar, Underscore and so many things appear. Its hard to understand where what fits in. Please note this session will not have any major code dives like the others we had in past, but there will be some small code demos. The main purpose of this session is to educate we need to start taking "Single Page Applications" seriously and understand it thoroughly and be able to choose right frameworks for it. 3. How to do Modular Development using AMD? 4. What are Data Bound Views, What is Micro Templates? 5. How to support HTML 5 properly? If this session does not suffice we will schedule a follow up session for the same 2 weeks after this one. You must be a member to post a comment. Join or login.